• Sediment filters screen out large particles like sand and dirt. 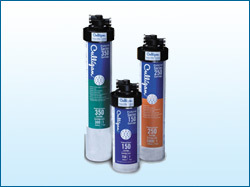 • Carbon filters improve water’s taste and odor. 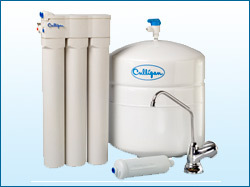 • Reverse osmosis filters reduce dissolved substances such as radium, lead, arsenic-5, and others. • Optional specialty filters are available to protect against specific contaminants such as arsenic-3, perchlorate, and volatile organic compounds (VOCs). • A second carbon filter ensures your drinking water is clean and fresh. The AC-30 Good Water Machine® utilizes three filtration methods to reduce copper, lead, selenium, barium, radium 226/228, cadmium, chromium and total dissolved solids (TDS) that affect the quality, taste and smell of your water. 1. Pre-stage Sediment Filter screens out sediment and microscopic particles that create cloudy water. 2. Reverse Osmosis Filter reduces barium, chromium, and/or radium 226/228, substances that might be contaminating your home's water. 3. Post-stage Carbon Filters - two carbon filters reduce elements that contribute to common smell and taste problems in water. Solve Taste and Odor Problems With an Easy, Affordable Solution. 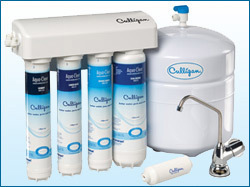 Get cleaner, clearer drinking water with proven water conditioning. Our Preferred Series advanced filtration system reduces aesthetic chlorine, lead, microbes and up to 99.9% of microscopic particles from your drinking water.